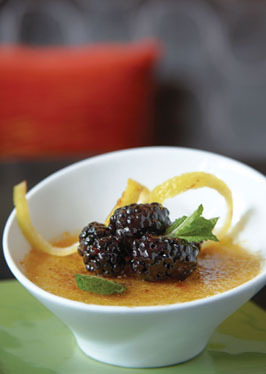 To serve: sprinkle custards with turbinado sugar; caramelize sugar with a blow torch until sugar melts and starts to bubble and brown; chill until ready to serve. Or, preheat broiler and place custard cups on baking sheet; sprinkle with turbinado sugar and broil until sugar melts and browns, about 2 minutes. Refrigerate until topping is hard and crisp, at least 1 hour to 2 hours. Combine blackberries and liqueur in bowl. Let stand at room temperature at least 15 minutes and up to 1 hour. Spoon berry mixture over custards just before serving. *Turbinado sugar is similar in appearance to brown sugar but paler, and in general the two can be exchanged freely in recipes. A popular brand name is Sugar in the Raw®.